Arizona and rain don’t typically go hand and hand, so why is it important for me to get my wipers changed? Do they wear out? What about these AutoTex Pink wipers you’re promoting? Even though you probably don’t remember that last time your blades were replaced, you would not want to be stuck in one of our Monsoon dust storms or thunderstorms with ZERO visibility! Rubber subjected to the Arizona sunshine breaks down more quickly which means your wipers need replacing more often than you may think. So, how often should wiper blades be replaced in order to ensure you are driving safely? Did you know that 1 in 3 drivers need wiper blade replacement and that most major windshield wiper manufacturers recommend changing wiper blades every 6 months or at a very minimum at least once a year? Some people believe the life of windshield wipers can be extended in areas where they are not often required. However, even windshield wipers on vehicles in exceptionally dry conditions that are rarely used should be changed often. Windshield wipers that are not used for extended periods of time can dry out, crack or become set in their position and fail to give appropriate service when they are needed. While most brands start off providing excellent service, many times they will begin to break down after a few months of use. After 6 months, there is frequently a noticeable deterioration in windshield visibility. Windshield wipers can deteriorate earlier than 6 months under certain conditions. If you notice streaking, chattering, worn or split rubber or damaged or bent wiper frames, you should replace the windshield wipers immediately, regardless of how old they are. Any of these conditions can distort the driver's view of the road and create a driving hazard. Both the driver's side and passenger's side windshield wipers should be changed at the same time. Most sport utility vehicles, station wagons and mini vans also have a rear windshield wiper. Pay special attention to this blade as well and follow the same guidelines. Now that you know a little more, is it time for you to change your wipers? If your answer is YES, consider the change to AutoTex Pink Wiper Blades. Not only does a portion of the purchase of these wiper blades go to a good cause, the National Breast Cancer Foundation, but you’re benefiting from great blade performance. Honest-1 has proudly become a distributor of AutoTex Pink Wiper blades. These wiper blades come in PINK and the traditional BLACK with a small pink ribbon on the blade. Whether you choose the traditional black or decide to go PINK, both types of blades display the breast cancer awareness ribbon on them and both show you are a supporter of breast cancer awareness and saving lives! Changing your blades is an EASY and unique way to show you support breast cancer awareness. 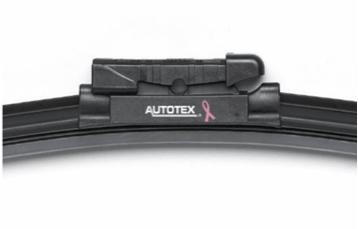 AutoTex Pink Wiper Blades are on sale at your Honest-1 Auto Care for a limited time. If you have to change your blades anyway, why not give back at the same time? “Wipe out Breast Cancer with Every Swipe”!